Mr and Mrs RA Clarkson were given a most pleasant surprise on Wednesday, the occasion being a surprise family reunion in celebration of their 40th anniversary. 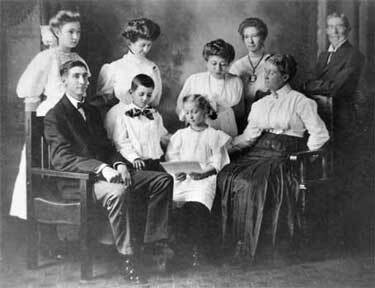 Early in the morning, unconscious of what the day would bring forth, Mrs Clarkson accompanied by her two grandchildren, Miss Elizabeth and Henryetta Boyd, of Oklahoma City, who have been visiting at the Clarkson home for a number of weeks, and Miss Etta Clarkson, went to Mt Vista to spend the day. During their absence, Mrs Walter Boyd, Mrs WH Vick, Edwin Clarkson and little son, of Oklahoma City, arrived as a surprise to celebrate the anniversary of the marriage of their parents. Mr Clarkson was soon let into the secret and upon the arrival of Mrs Clarkson and daughter at Electric park, returning from their day’s outing, they were most happily greeted by the rest of the family. To complete the pleasant surprise a most sumptuous dinner had been prepared by the visiting members, and amid many congratulations and good wishes the day passed, making it one of great pleasure and thorough enjoyment.